Monday June 18th 1900 Will churned twice for me this morning and went to Hill Siding to sell some oats I was busy a great part of the day looking after my little chickens Tuesday June 19th 1900 I took of more little chickens and did the other work. Will was hauling oats. I went down to Adas in the afternoon with him on the load. Did evening work. Wednesday June 20th 1900 I was busy with the regular work and the chickens Will hauled oats all day with Leonards help in the afternoon finished them up they brought $76.67 Thursday June 21th 1900 I did baking and got the dinner early besides working the butter all ready for town. Will and I went up in the afternoon though it looked like rain There was a shower after we came home. Nellie Byington here. 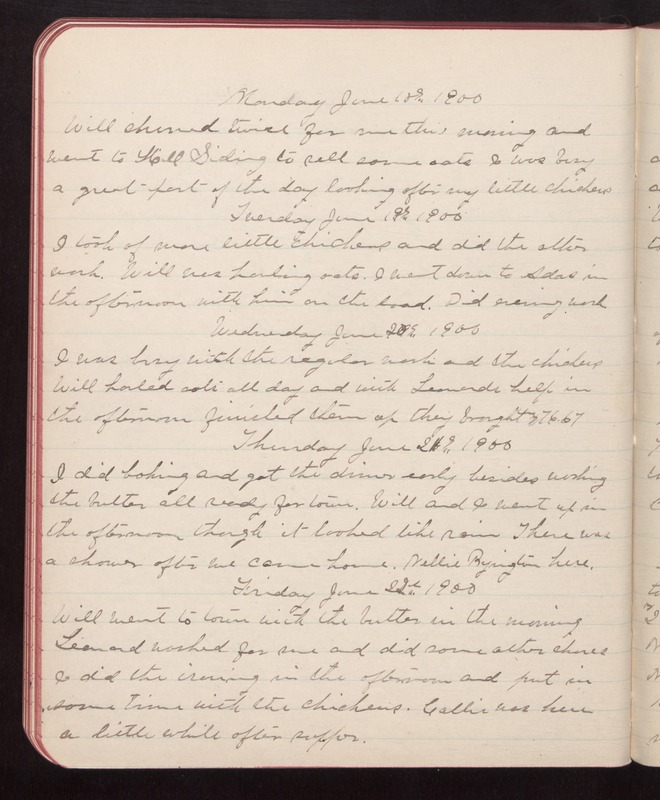 Friday June 22nd 1900 Will went to town with the butter in the morning Leonard washed for me and did some other chores I did the ironing in the afternoon and put in some time with the chickens. Callie was here a little while after supper.